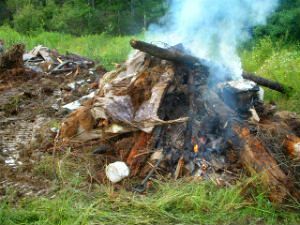 Under Vermont Air Pollution Regulations, the open burning of natural wood and yard waste from property maintenance, property clearing, and so forth is allowed without a permit from the Air Quality and Climate Division. Open burning of trash is never allowed in Vermont, however, there are still reports of illegal burning across the state. 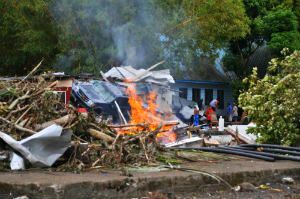 The burning of garbage, tires, rubber, plastic, waste oil, asphalt materials, asbestos, pressure-treated wood, and plywood are all prohibited. We encourage towns to post open burning information at town offices and on Front Porch Forum, especially in the spring and fall when property-clearing activities tend to increase. Additionally, towns can enact a local ordinance and designate an enforcement officer. A model ordinance, poster, pamphlet, and additional information are provided below, and a ticket book can be requested from the Vermont Judicial Bureau at (802) 295-8869. Furthermore, the highest ranking fire department official on hand has the authority to extinguish an illegal burn per 20 V.S.A. §2673, and per 24 V.S.A. 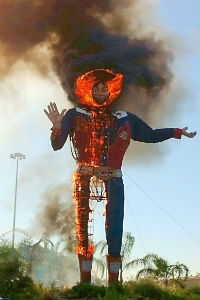 §2201, local police can respond to illegal burning complaints. Generally, fire wardens are concerned with forest fire prevention, and are not responsible for environmental rules. Flyer - "A Smokestack in Every Neighborhood"
Flyer - "No Such Place as a Faraway Place to Burn"
Flyer - "Air Pollution Has No Boundaries"
Flyer - "Think of the Children"
Flyer - "Health Effects of Burning Specific Materials"
If local officials are unable to respond to an open burn incident, you can contact a regional Environmental Enforcement Officer (EEO). Major illegal burning cases (large piles of refuse, whole structures, etc.) or repeat offenses can also be referred to your regional EEO. Complainant name, address, and phone #. Alleged violator's name, location, and phone #. Who started the fire? When? Was a permit obtained from the Fire Warden? Sensitive populations? Schools, day cares, elderly, etc. Type of materials being burned (photos are good). For general questions about open burning please contact Dave Shepard at (802) 272-4088 or dave.shepard@vermont.gov. What Electronic Devices Can I Recycle?